Micro-investing seems like it's here to stay. In other words, investing with just $5 is a real thing. It's not the same thing as a robo-advisor, though. Those companies manage your funds for you. Stash guides you but does not invest for you. That's up to you. Stash makes it possible to invest by guiding you to the right investments and allocations. It spells things out in layman's terms to help you become an investor (assuming that's what you want). It's not a hands-off approach to investing. Instead, it's a hand-holding approach. Nothing is too complicated in Stash and if it is, they have more help to push you along. Keep reading to see if Stash is right for you. Stash focuses on ETFs like most micro-investors and robo-advisors do, but they do throw in the opportunity to invest in a handful of well-known stocks. Stash has thousands of ETFs available, but don't worry, they won't overwhelm you with all of the choices. They narrow it down based on your risk level. Stash does offer the opportunity to save for retirement as well. Stash Retire, as they call it, requires a $5 minimum investment. You can open a traditional or Roth IRA. They don't offer IRAs for small businesses or entrepreneurs. To get started, you'll answer a series of questions that helps Stash evaluate your risk tolerance. Again, this is similar to most other investment companies, as it's based on your goals, age, and desired risk level. From there, Stash gives you approximately 40 themes to choose from, which is just enough to have choices without getting overwhelmed. Once you decide to move forward, you link your bank account to Stash and begin investing. Is Stash worth it? Stash could be worth it if you've never invested a penny in your lifetime and you have an interest in learning about how it works. Because you are in charge, you have to be able to remove the emotional component of investing from your mind. Stash does a good job of providing you with advice against jumping ship the moment things get bad, though. If you have experience in investing, however, you'll likely find the advice trivial and the fees too high compared to other investment companies. Stash charges investors with less than $5,000 invested $1 per month. That doesn't seem like a lot, but if you look at it as a percentage of your assets, it could be huge. Let's say you invest just $100 at first. $1 is 1% of your invested assets. If you compare that to the average robo-advisor, you'd pay around 0.25%, or just $0.25. 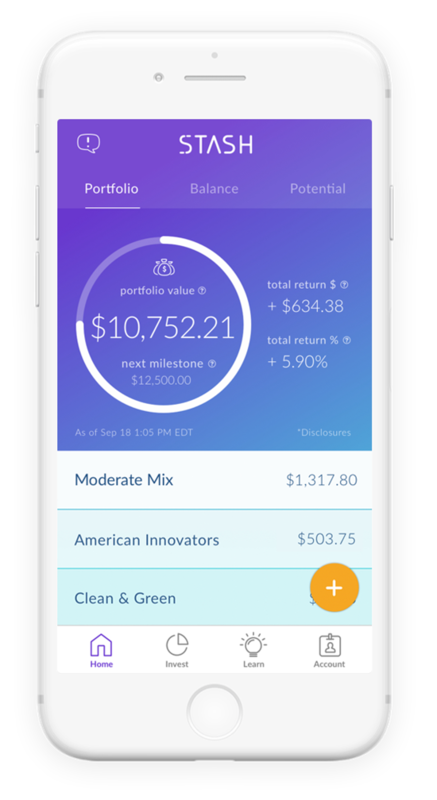 Once you have more than $5,000 invested with Stash, your fees change to 0.25% of your assets under management per year. This is more along the lines of the fees charged by other investment companies. If you open a Stash Retire account, you'll pay $2 per month for the first $5,000 invested. After that, you'll pay 0.25% of the assets under management per year. Stash is mainly a mobile app. It's available on Android and iOS devices. You can sign up for an account online, but to start investing, you'll need the app. The app itself is pretty useful. You can get a snapshot of your account and its potential with the click of a few buttons. As it pertains to actual investments, you can learn everything you need to know about a theme in one screen. In layman's terms, you'll learn about the investment, see a graph regarding its risk level, learn the expense ratios, and see the underlying holdings in each ETF. If you are into social sharing when it comes to investing, Stash is your app. You can link your social media pages, such as Facebook, and share investments with your friends. They won't see how much you invested or even the performance. You and your friends can simply share the investments you've chosen. Sometimes it can be the push you need to invest in a particular theme or stock. 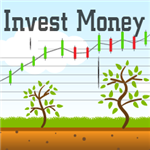 Stash offers many educational opportunities to help beginners learn how to invest. Stash really caters to beginners, which not many investment companies do. Even those that say they are for beginners don't break the lingo down into layman's terms as well as Stash. The Stash Coach does a good job of guiding new investors through every step of their portfolio. It encourages diversification and eliminates emotional investing. There is no minimum balance required. You don't need a minimum balance at any time with Stash. But, if you want to invest, you'll need at least $5 in your account to do so. They don't charge any fees if you are below that amount, though. You can buy fractional shares. If you can't afford a full share of a desired stock, Stash allows the purchase of fractional shares. They splits up the share among several investors to make it more affordable. You can open a custodial account. If you have children or grandchildren with an interest in investing or you want to start an account for them, you can open a custodial account. You must be 18 years or older to open your own account, so this gives younger investors a chance to get things going. You can invest in "themes." You won't see unrecognizable names of ETFs to choose from when investing. Instead, you'll see themes that you can choose from. From the themes, you will see the individual ETF options, again spelled out in layman's terms. Stash names the ETFs based on their theme. Beginning investors often can't decipher the ticker tape language used. Stash changes the names to things like American Innovators or Global Investment. This gives you a better idea of what to expect within the theme. Clicking on the desired theme will give you examples of the holdings within that theme to help you even further. 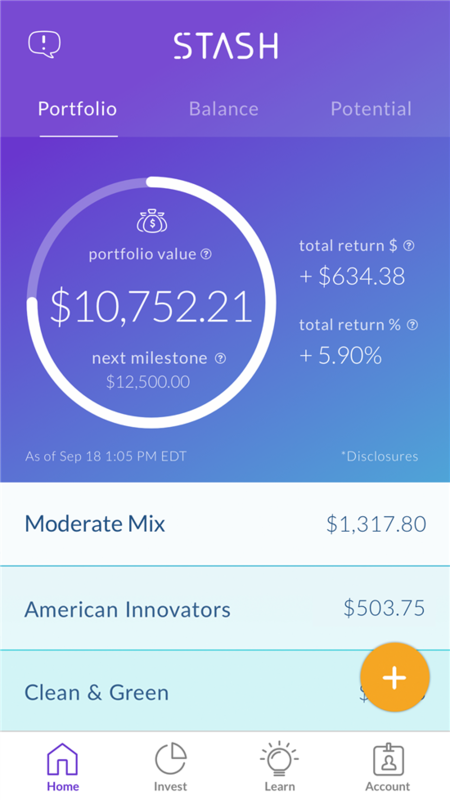 You can see your portfolio's "potential" right in the app. This gives you the chance to see how things would change if you invested more aggressively or added more money to the account. The Stash Coach continually encourages habitual investing or saving to increase your portfolio and future earnings. You can track your progress with Stash's Milestones. Stash sets certain milestones for you and then helps you recognize/celebrate them when they are met. You'll see the milestones when you first sign up and then be congratulated when you meet them. This is another way Stash helps to motivate you to keep investing. Stash automatically transfers "extra" funds into your investment account. Stash offers the Smart-Save option, which automatically transfers extra funds after monitoring your checking account for a while. If they see a chance to save a little extra money, they transfer it right into your Stash account. They do keep a specific and "safe" cushion in your checking account, though. You can withdraw funds at any time. Stash doesn't charge you to withdraw your funds. You can do so at any time without penalty. Note: Funds are not immediately available. If your funds are invested in stocks or ETFs, you must sell the assets before withdrawing your funds. It takes 2 business days to execute an order, as this is an SEC regulation. You must wait 5 business days after selling the assets before you can withdraw the funds. This helps decrease the risk of fraudulent activity in your account. The fees are high for small investors. We discussed this above, but it's worth mentioning again. 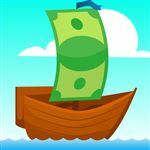 Small investors (investors with less than $5,000 invested) can pay a large portion of their investments in the fee. $12 a year doesn't sound like a lot, but when you only invest around $100, it takes away from your investment potential. The ETF expense ratio is often high. The average ETF expense ratio with Stash is 0.34%. This is quite high, since the average ETF expense ratios tend to range from 0.06% to 0.20%. There isn't a lot of opportunity for research. If there's one thing that's important when investing, it's research. Even though Stash is for beginners, they have very little to offer in the way of research. They offer plenty of education, but it's basic terminology rather than true industry research. 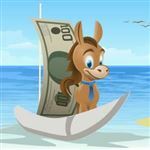 Check out our comprehensive guide on best discount brokers for beginners. Is Stash safe? : Stash goes to great lengths to protect your identity and investments. They are regulated by the SEC and use bank-grade encryption to protect your privacy. The money itself is held by Apex Clearing, which is a broker that is regulated by FINRA. You are also protected by the SIPC, which offers protection up to $500,000 should the broker-dealer go under. This is not any type of protection against bad investments or bad advice, though. Acorns helps you invest "spare change" by rounding up your purchase to the nearest dollar. Once you reach $5, they withdraw the funds from your linked checking account and invest the funds for you. 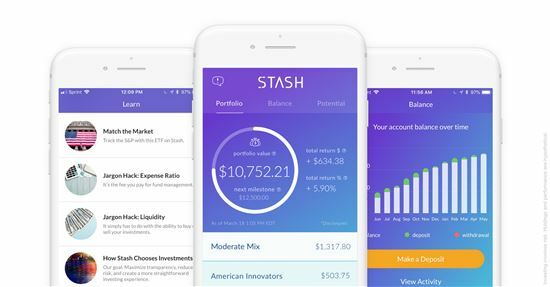 It's a micro-investor and robo-advisor all in one, whereas Stash is a micro-investor, but not a robo-advisor. Part of service fee: $1/mo for balances under $5,000; $2/mo for Retirement accounts under $5,000; 0.25% for accounts $5,000+. No add-on trading fees Part of service fee. Free for college students for 4 years. No add-on trading fees. No Acorns Spend checking account comes with a debit card and has no minimum balance requirement, no overdraft fees, and unlimited free or fee-reimbursed ATMs nationwide. $3/mo for Acorns + Acorns Later + Acorns Spend. Investors use Robinhood primarily to trade stocks without paying commissions. Unless you sign up for their Gold subscription, you don't pay any fees. Like Stash, though, they don't manage the investments for you. It's up to you to choose the investments and do the actual trading; they just guide you along the way. Betterment is one of the leading robo-advisors, but with no required minimum, it can be good for beginning investors as well. If you are looking for human advice and a more hands-off approach to investment, Betterment would be a better option. Is Stash the choice for you? It depends if you are a true beginner and only have small amounts to invest. If you really want to get the hang of investing, this can be a great starting point. If you are more of a hands-off investor, this is not the best choice for you as you make all of the decisions and manage the funds. A robo-advisor is a better option for those looking for a more hands-off approach.